Low labor productivity opens door to greater automation. Eighty-six per cent of wage workers in the textiles, clothing, and footwear (TCF) sector are at high risk from automation, according to the ASEAN in Transformation report from the International Labor Organization (ILO), released recently. “Estimates indicate that a significant share of the TCF sector’s wage workers are at high risk from automation, ranging from 64 per cent in Indonesia and 86 per cent in Vietnam to 88 per cent in Cambodia,” the report noted. TCF is not only the vulnerable sector but it faces the highest risk compared to other manufacturing sectors. “The TCF sector predominantly consists of repetitive and mundane jobs that are replaceable by programmed machinery and engineering advancements,” the report stated. It explained that when technology is introduced and workers become redundant in ASEAN’s TCF factories they are absorbed and retrained in other departments because technology upgrades in ASEAN have thus far been incremental and small-scale and re-skilling and redeploying workers has been a common practice. “When technologies such as additive printing, the IoT, big data analytics and automation (sewbots) improve and become integrated with one another, ASEAN’s TCF sector will look very different,” the report predicted. Unless the workforce can offer a marked improvement in productivity and quality, millions of jobs could be at risk, it went on. The figure indicates an uncertain outlook not only for Vietnam but also for ASEAN’s young workers in TCF, and the ILO is concerned that women are predominantly affected and often view the sector as a first step in the job market. “The sector may no longer have the capacity to absorb large numbers of low-skilled workers who are typically recruited from rural areas or farms,” the report added. Otherwise, ASEAN’s factories are likely to turn to graduates from reputable vocational training institutions and such recruitment will provide factories with higher skilled workers who can work with modern technology, the report said. In 2014 Vietnam became the world’s third-largest footwear exporter, with a global market share of 7.6 per cent, and the fifth-largest textile and garment exporter. Figure 3.1 highlights the sector’s success in the country, with exports adding up to $36.9 billion. 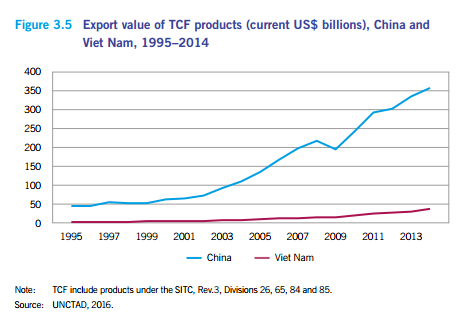 Total employees in the TFC sector in Vietnam in 2013 was 2.6 million, accounting for 36 per cent of all manufacturing employment. In Indonesia the number was approximately 3.7 million in 2014, accounting for almost 25 per cent of total manufacturing workers. 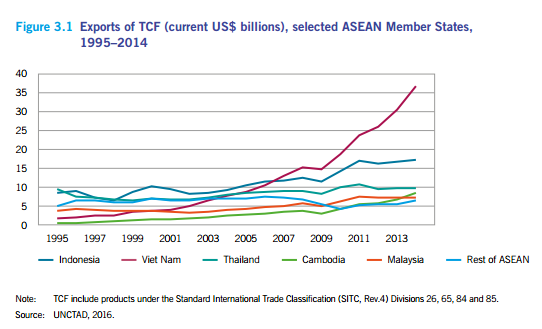 TCF in Cambodia employed 749,000 workers in 2012, accounting for almost 60 per cent of total manufacturing employment. Though the average age in the six ASEAN countries where the sector has a strong presence is 31.2 years, the workforce is also characterized by low productivity and low education levels, the ILO evaluated. Technology transfer has been conducted to increase labor and product quality and reduce waste. “Across the region, productivity gaps between TCF manufacturing and overall manufacturing remain wide,” according to the report. 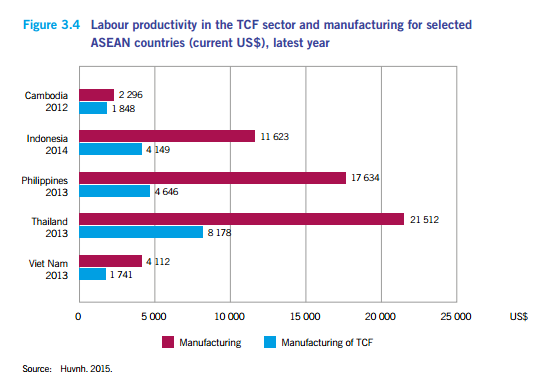 In the Philippines and Thailand, for example, labor productivity in overall manufacturing is 3.5 times and 2.7 times greater, respectively, than in the TCF sector. Differences within major TCF economies are also large. “Vietnam’s labor productivity in the TCF sector is alarmingly low - only 20 per cent of Thailand’s,” the ILO noted.